The sixth night of the Dublin 2018 European Championships saw a further six gold medals added to GBRs tally and were won by female athletes. The Women’s S14 100m Butterfly final saw a clean sweep of the medals for GBR, Jessica-Jane Applegate was the Brit at the centre of the podium, she lowered her own world leading time to 1:04.13 for gold. “It’s hard to describe the feeling, after all the hard work over the last few years, it’s paid off. I wanted this so badly so I really worked for it. This is Applegate’s first European title to add to her Paralympic and World titles. Bethany Firth was the silver medallist, she clocked a time of 1:05.43 both improving on her heats swim and lowering her seasons best. Completing the podium for GBR was Louise Fiddes, who train’s in Hatfield, she was just 0.04 seconds off the Firth and finished with bronze. After qualifying fastest for the final, Tully Kearney carried through her form as she powered to gold and European title of the Women’s S5 100m Freestyle. Kearney pulled ahead of the eight-strong field in the early stages of the race and posted a time of 1:18.79, an improvement of more than two seconds from her morning heats swim. “It’s been a tough week here in Dublin but the gold makes it all worthwhile for me. “As I’ve said previously, classification is such a big and important part of para-swimming so I understand that it needs to be done thoroughly, I’m just glad it’s done for me now. “After not being able to swim in Rio, I didn’t think I would actually ever swim again, let alone at a major championships so being here in Dublin is a dream come true. She was joined on the podium by Monia Boggioni of Italy and Inbal Pezaro of Israel who collected silver and bronze respectively. After several days off from racing in Dublin, Eleanor Robinson returned to action and did so in style as she went one better than her 2016 European silver and claimed the gold and continental title. Her winning time of 35.37 was just off her personal best and own World record of 35.22. On confirmation of the victory Robinson said, “It’s really great to get the gold medal, I’m really pleased with the outcome and it’s actually the second fastest time I’ve ever done. “The race still wasn’t perfect or how I’d liked it to have felt but I’m intrigued to see how fast I can go in this event. The silver medal went to Nicole Turner of Ireland and the bronze will return to Ukraine and Oksana Khrul. Toni Shaw claimed her first gold medal and European title in the Women’s S9 400m Freestyle, to add to the collection of four medals already won in Dublin. After she delivered a controlled heats swim, Shaw returned to the water to post a new lifetime best of 4:42.43. “It’s absolutely amazing, it means so much. I’ve been working so hard for this so I’m so happy,” said Shaw. Shaw was flanked on the Dublin 2018 podium by Spain’s Nuria Soto Marques for silver and Zsofia Konkoly of Hungary who took the bronze. Hannah Russell won gold in the S12 100m Free, her third podium topping performance of the championships. A delighted Russell said, “I’ve really happy. I’m came here wanting to try and get as close to my PB as I could. Silver went to Alessia Berra of Italy and bronze to German Elena Krawzow. Alice Tai made it a treble of gold medals here at the European Championships, she touched first in the Women’s S8 100m Butterfly and claimed yet another 2018 European title in Dublin. Tai explained after the gold medal race, “It’s great to have three finals in three days and come away with three golds, I’m really happy. “I’ve been focussing on my recovery strategy for after the heats and changing a few things. That’s been a bit of a hurdle for me here though. 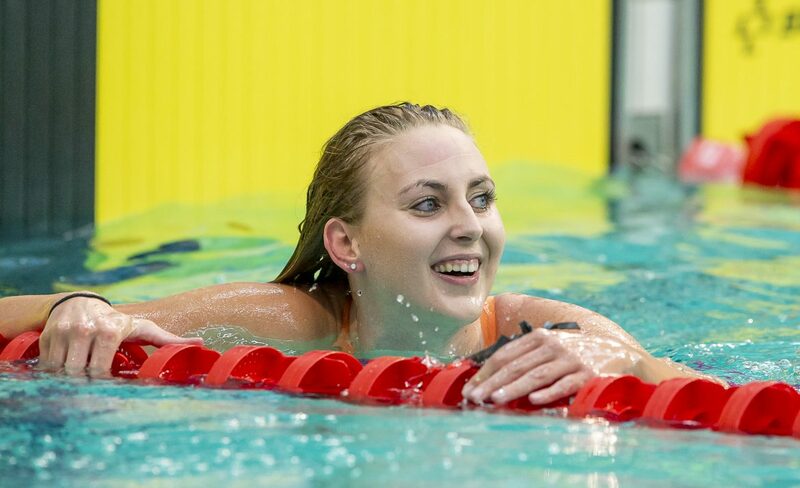 The Manchester-based swimmer collected her medal alongside Kateryna Deneysenko of Ukraine who claimed the silver medal and the Netherlands Cleo Keizjer for the bronze. Lewis White battled for the title in the Men’s S9 400m Freestyle final, the Derby-based swimmer fought hard over the eight lap race of Dublin’s National Aquatic Centre but just couldn’t quite catch European Champion and World Record Holder, Federico Morlacchi of Italy. Bronze went to Jacobo Garrido of Spain. Stephen Clegg picked up yet another medal at these Championships, he claimed the bronze in the Men’s S12 100m Freestyle, his time at the touch 54.77. He joined Ukrainians Iaroslav Denysenko and Maksym Veraska for the medal ceremony who took gold and silver correspondingly. Jordan Catchpole went in the final of the S14 100m Butterfly but was held off the podium by Vaysl Krainyk of the Ukraine. The final race of the night saw Michael Jones go in the Men’s S7 100m Freestyle final. He finished in a time of 1:05.79 and ranked sixth at the end of the race. The medal were shared amongst Federico Bicelli of Italy (gold), Ievgenii Bogoddaiko of Ukraine (silver) and Andrii Tusov also of Ukraine (bronze).